In comic books, there is the superhero and the alter ego. Spiderman is actually Peter Parker and Batman is actually Bruce Wayne. Both of them wake up every morning as their alter egos and have to dress up in order to become the superhero. The same can be said about me. Everyday, I wake up as Camron Green. I put on my costume and enter the school as Cheeseburger. 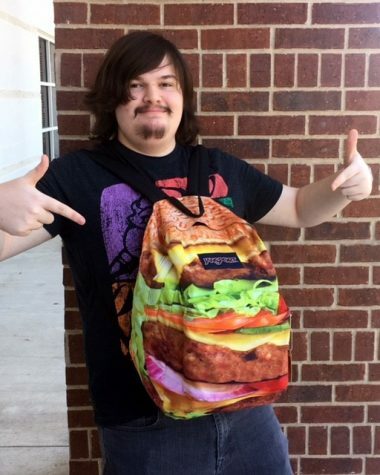 Spiderman and Batman have suits and masks which qualifies as their costumes, but all it takes for me is my cheeseburger backpack. Cheeseburger travels far and wide to get to each class day by day; working hard and socializing with his friends. Camron Green, on the other hand, slumps down on his couch as soon as he gets home and does everything in his power in order to achieve maximum relaxation. If Bruce Wayne needed Alfred and Peter Parker needed Uncle Ben, then Camron Green needs time to rest at home. Hi! I’m Cameron and I’m this year’s sports editor.